Charles Luk used the Wade-Giles system of transliteration, which has now been largely replaced with the system of modern pinyin developed on the mainland of China. Both systems use the Roman alphabet to phonetically represent the ideograms that comprise the written Chinese language. Today, people in the Western world have a more or less immediate access to a wealth of information (through the internet) regarding China and its culture, which was unthinkable during the 1960’s. Just as Charles Luk was breaking new ground with his ‘Taoist Yoga’ translation, today effort must be made to update the knowledge already possessed in the West, about the practice of Daoism developed in the East. New and innovative ways must be found to make the traditional knowledge relevant to a modern and post-modern world, premised upon logic and science. Zhao Bichen has already started this process, and through Charles Luk’s translation, sincere Western students of the Dao can take the teachings forward – all this process requires is correct and reliable information free of prejudice and ignorance. In this regard, readers are advised to also consult the extensive Glossary (Pages 177-199 of Taoist Yoga) that Charles Luk has provided, and to utilise what follows as a means of gaining perspective and context on the path of Daoist self-cultivation. Zhao Bichen (1860-1942 – accomplished Daoist master and author of a number of Daoist books including the subject of Charles Luk’s ‘Taoist Yoga’, entitled ‘The Secrets of Cultivation of Essential Nature and Eternal Life’ (性命法訣明旨 – Xing Ming Fa Jue Ming Zhi). Renowned elder brother of Zhao Bichen and – fellow advanced Daoist practitioner particularly known for his martial arts mastery. Throughout his manual, Zhao Bichen mentions his brother with the utmost of respect. The chosen English language title for Zhao Bichen’s translated book entitled ‘The Secrets of Cultivation of Essential Nature and Eternal Life’ (性命法訣明旨 – Xing Ming Fa Jue Ming Zhi). Area within the body of energised psycho-physical awareness – also bodily area containing organs. An area corresponding to the anatomical centre of the structure of the brain organ, and in developmental and medicinal terms, is related to, but distinct from, the upper tan t’ien, and the ‘divine-sky aperture’ (天门 – Tian Men), situated at the centre of the top of the skull bone, as well as the ‘ground gate’ (地门 – Di Men) situated at the base (or ‘tail’ area) of the spine. This refers to the pristine state of innate energy in the body prior to birth into the physical world – and the cutting of the umbilical-cord connecting the baby to the mother. In this pre-birth, or pre-natal state, the baby does not breath through the nose and mouth, and generative force, (jing), vitality (qi), and empty spirit (shen), are not yet sullied through the experience of the external world. Daoist self-cultivation aims to restore this ‘pre-natal’ unified purity whilst living in the world. The ordinary state of life in the world entered immediately after the birthing process. 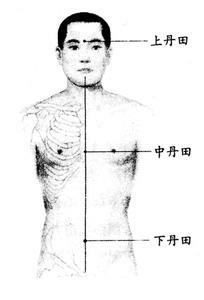 The human being breaths through the nose and mouth, and due to the sensing and abiding in the physical world amongst various objects, perception splits into a basic duality, and generative force (jing), vitality (qi), and empty spirit (shen), lose the unified state as existant during the ‘pre-natal’ period. Daoist cultivation strives to re-acquire the ‘prenatal’ breath (that is not reliant upon the process of ordinary breathing), by harnessing and refining the postnatal state, and in so doing, reverting to a earlier pristine state. An important Confucian term denoting an underlying (and realisable) universal interconnectedness. Often translated as ‘One Reality’ within Taoist Yoga. Associated with yang energy, hun is the part of the human spirit that can leave the physical body and ascend into the divine sky. This can happen at the death of the physical body, or in the case of a sage, be the consequence of an act of will whereby hun leaves the body and travels around the universe, before returning to that body. Associated with yin energy, po is the part of the human spirit permanently associated with physical matter of the human body. It cannot detach from the physical body and soar into the heavens like hun, but upon the death of the physical body, drops down into the earth. Highly refined qi-energy. Prana is the Indian Sanskrit term which is considered synonymous with ‘zhen qi’ within Daoist self-cultivation. The triple heater represents psycho-physical areas in the thoracic, abdominal and pelvic cavities which represent centres of intense energy production, that do not exclusively correspond to any specific organ, but which are related to organs in general, and the metabolism associated with those organs. In one theory, the upper burner (上焦 – Shang Jiao) extends from the heart to the head.